We are on another road trip. I just love road trips. 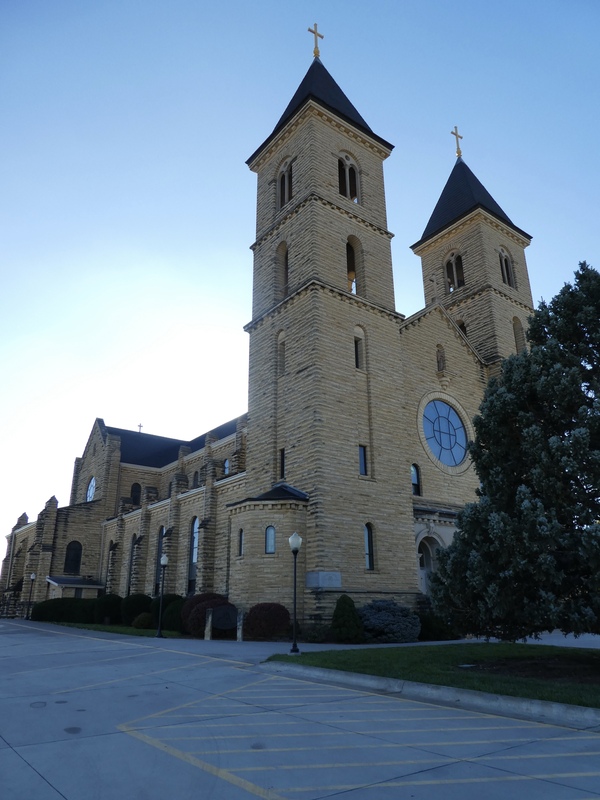 Driving through Kansas on I-70 we saw a sign for Cathedral of the Plains. So, of course, we had to see it. This church is beautiful, and big. This church is not a seat for a bishop, so it really is not a Cathedral. In February 2014, the church was declared a minor Basilica. 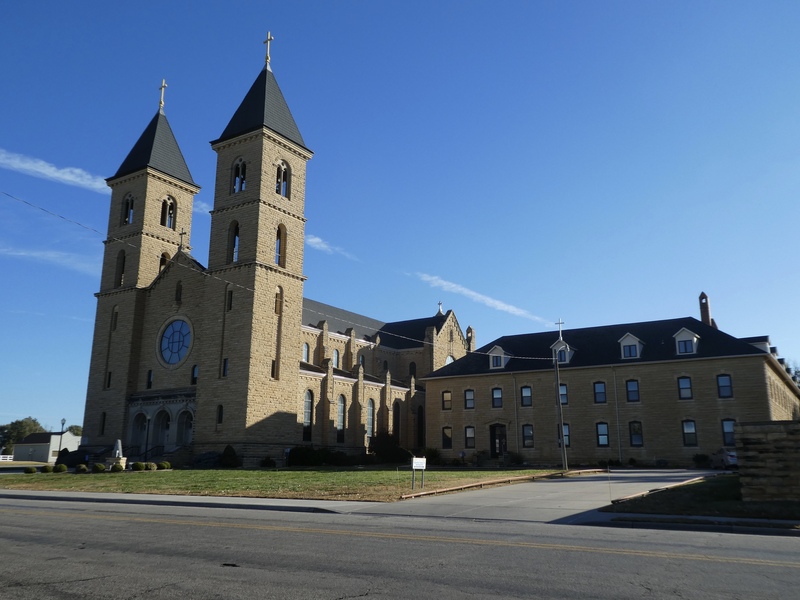 The first Basilica in Kansas and the 78th Basicila in the United States. But it is still called Cathedral of the Plains by many people. 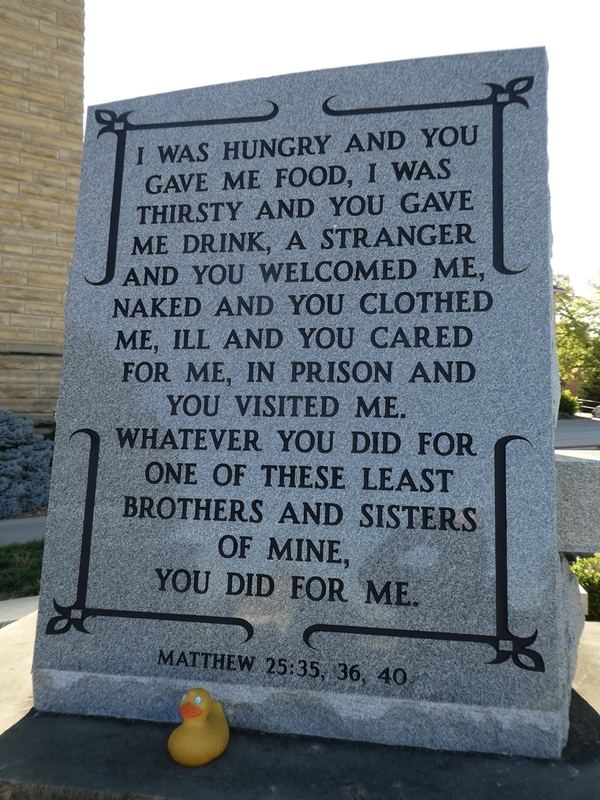 We liked the carved Bible verses in front of the church. 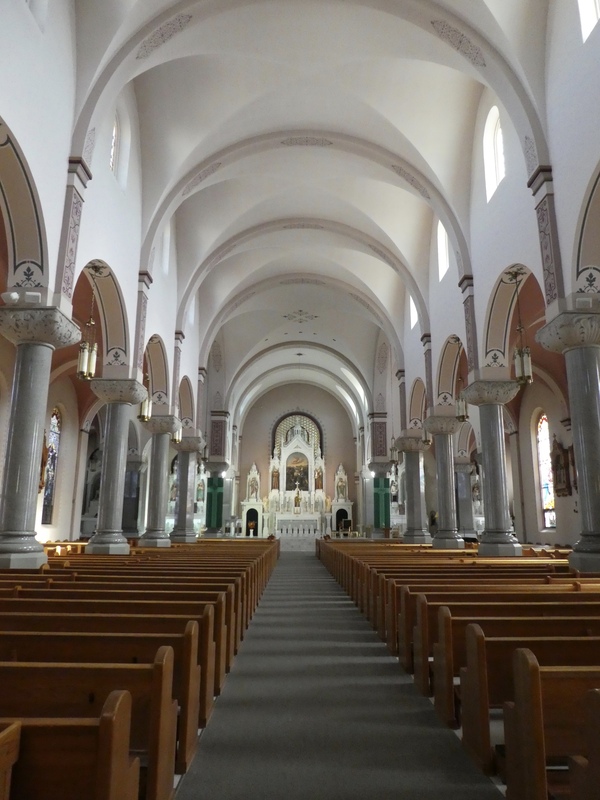 This Basilica is 220 feet long, 110 feet wide with two towers, each 141 feet tall. From the other side, we can see an additional area for church use. The exterior of the Basicila is made from native limesone blocks. We admired this exterior, but I want to see the inside. We are getting closer, and mom said we can go inside. Wow! Isn’t this beautiful? The ceiling is 44 feet above ground. 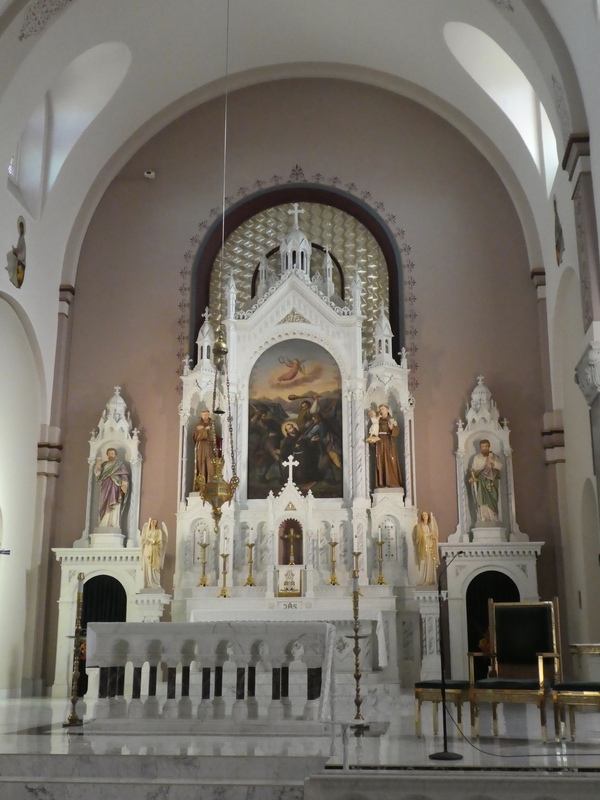 This altar is made from Italian marble. 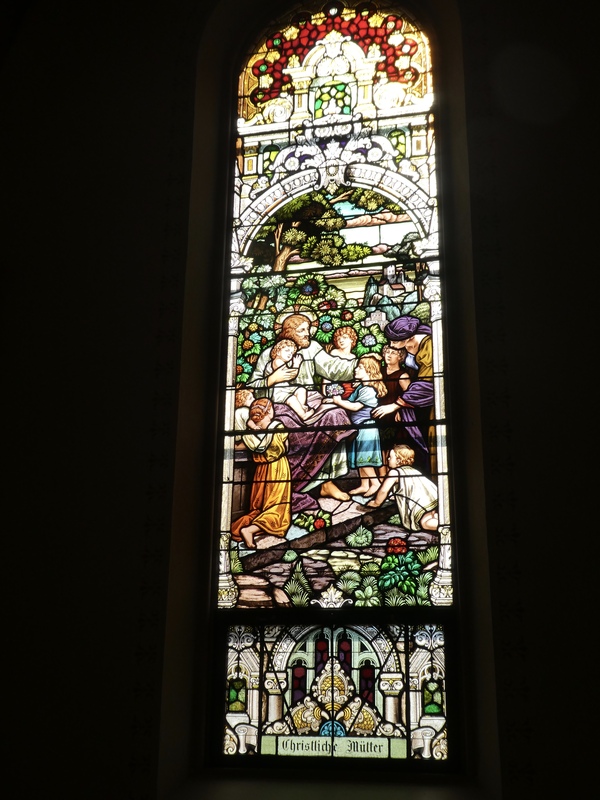 Along both sides of the church there are beautiful stained glass windows. I love these big windows. The sun shines through the glass in a perfect way. 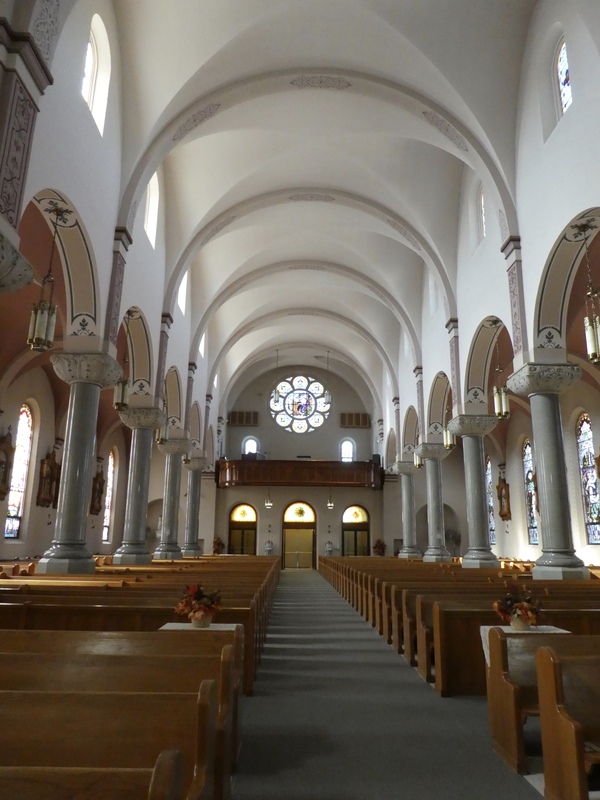 From the altar, let’s look to the doors and the choir loft. Isn’t that circular window beautiful? Don’t you just love to visit huge, beautiful churches? I do. Construction on this church began in 1908 and was completed in 1911. The community had outgrown three previous churches. The first 23 pioneer families arrived here April 8, 1876. These pioneers were Volga-Germans. As more pioneers arrived, the town flourished and this church was built. Across from the Basilica, we admired this statue, a tribute to the early pioneers. 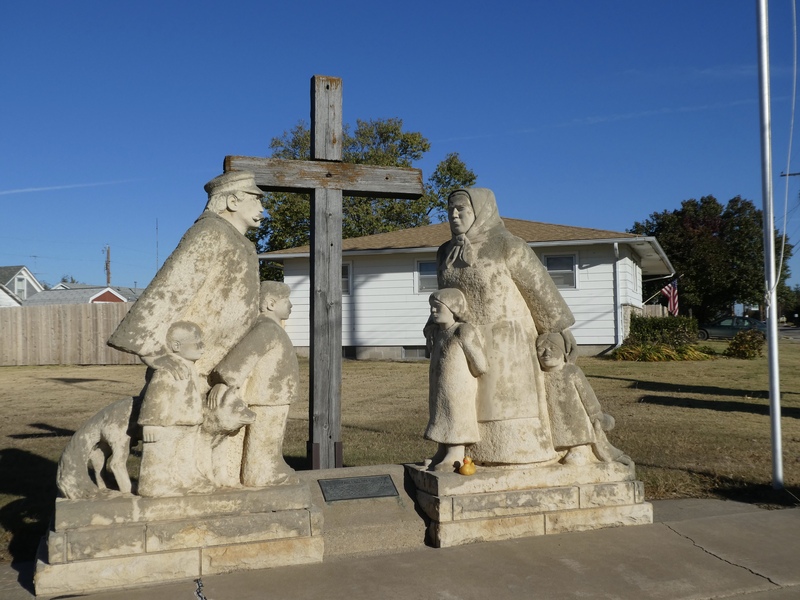 Victoria, Kansas is a small town that is proud of its history. 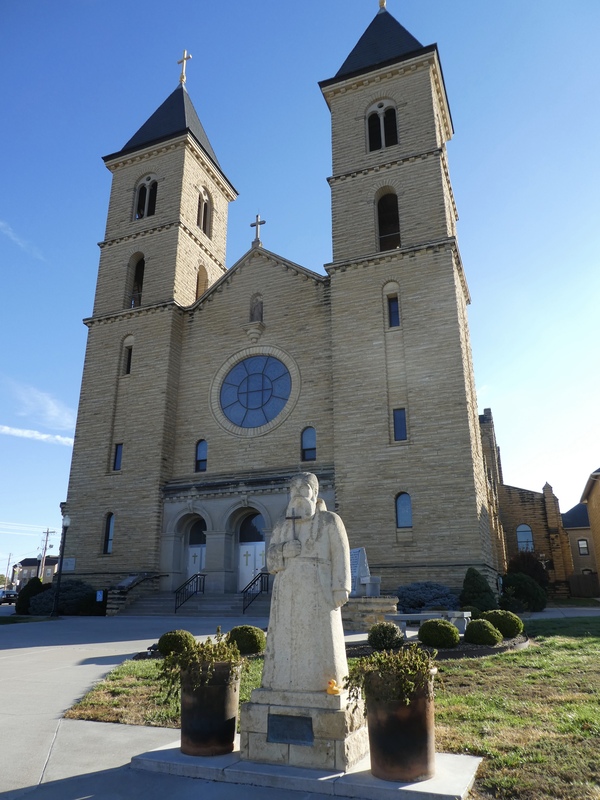 I, Zeb the Duck, hope you visit St. Fidelis Church, commonly known as the Cathedral of the Plains. It is just a few miles from the highway and I think you will love it. 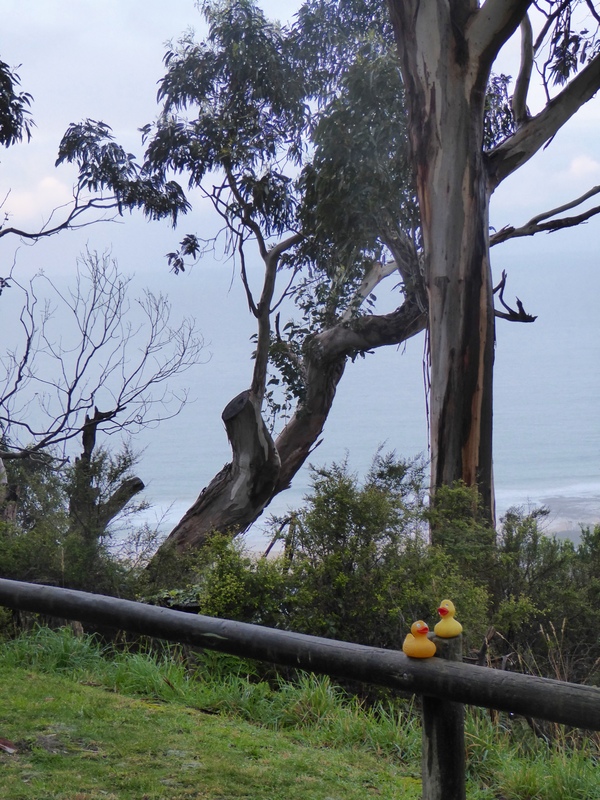 Zeb and Eider Duck and the humans loved this view from our hotel, Beacon Point Ocean View Villas near Apollo Bay, Victoria, Australia. 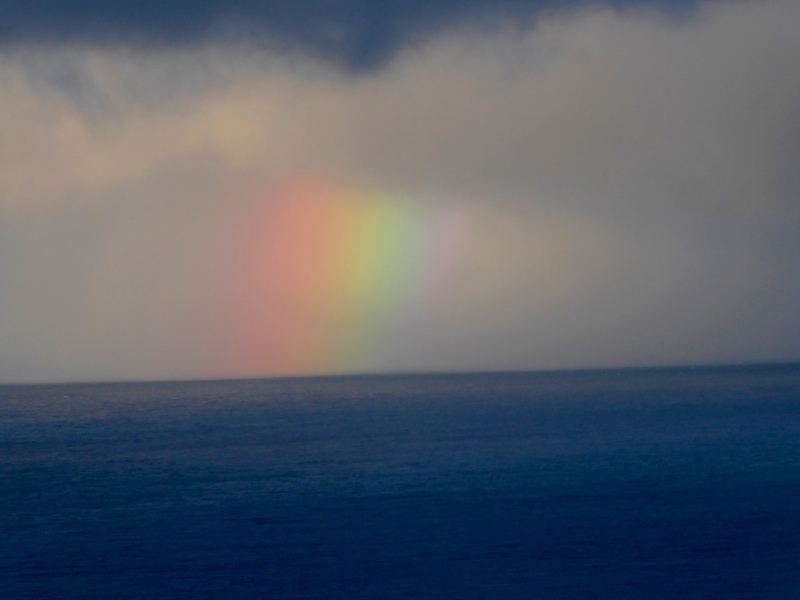 Just before we left, we admired this rainbow. Isn’t that a great sight first thing in the morning? 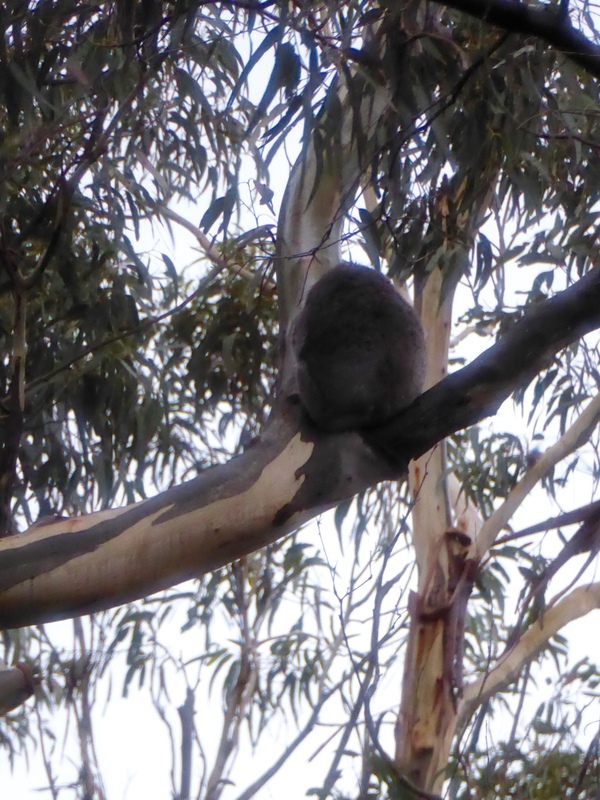 Driving to the Great Ocean Road, Fabian spotted this koala. we admired this clear water. 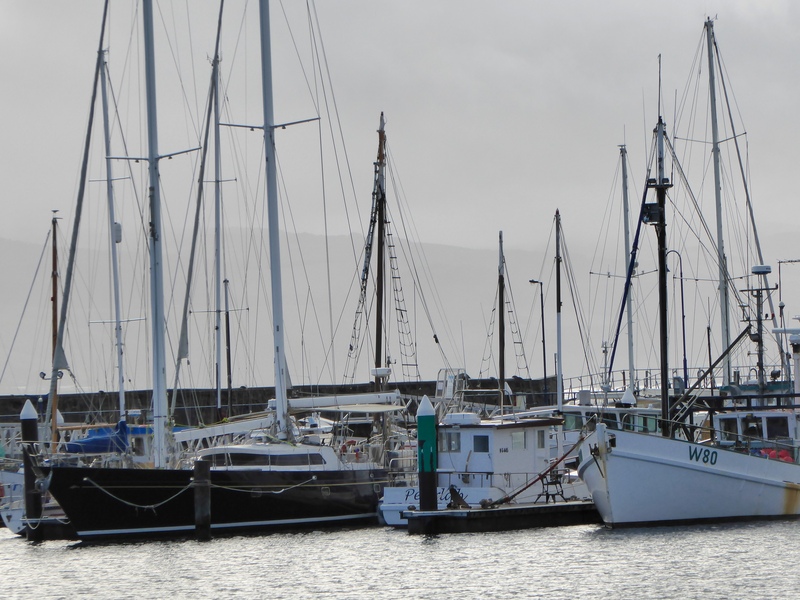 We also admired the boats. 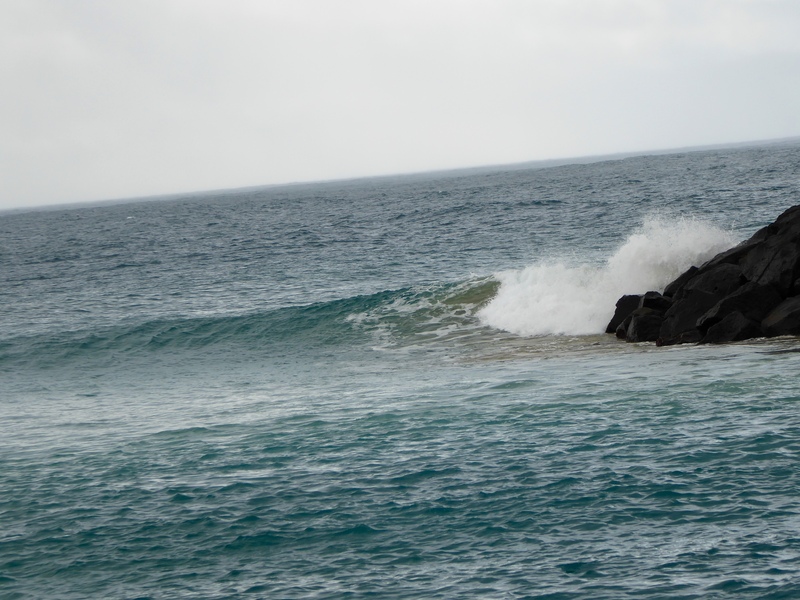 We loved the waves breaking. 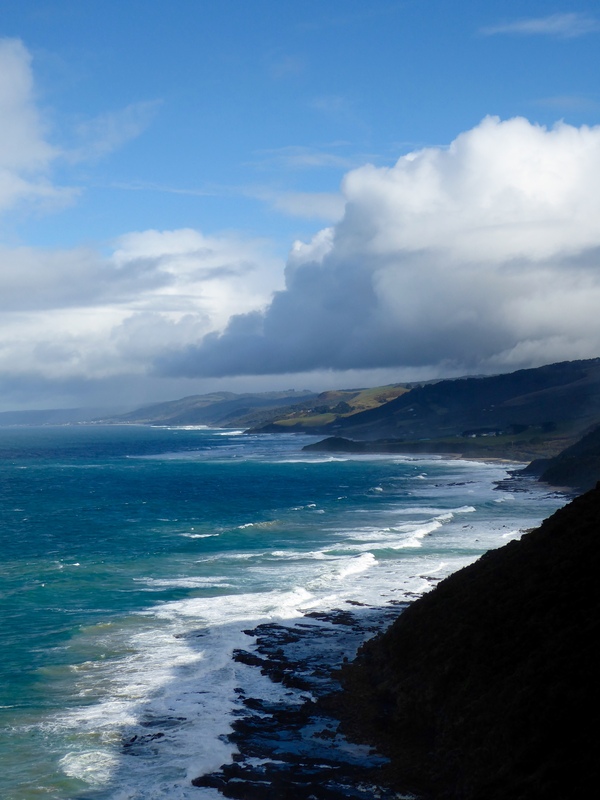 Driving on the Great Ocean Road, the views were beautiful. This was from Cape Patton. At the next stop, the humans fed colorful tropical birds. 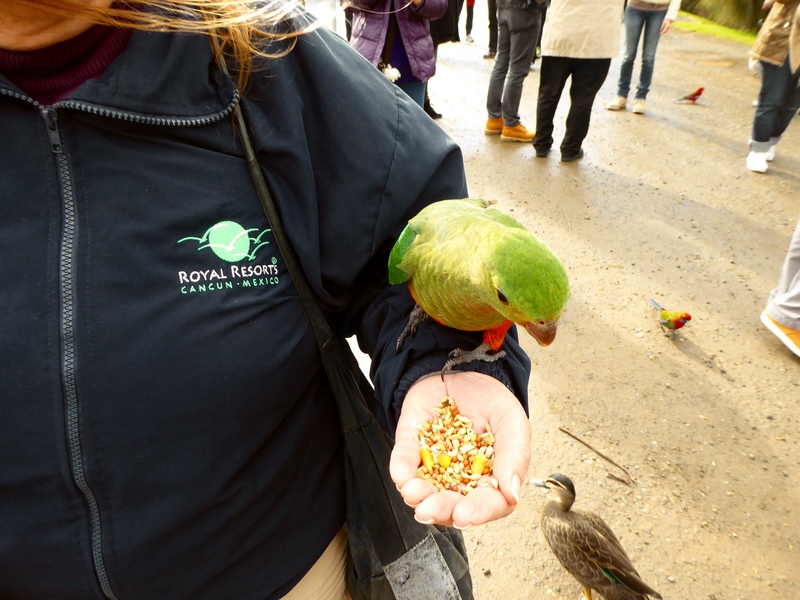 Humans were given a handful of bird seed and this King Parrot knew what to do. 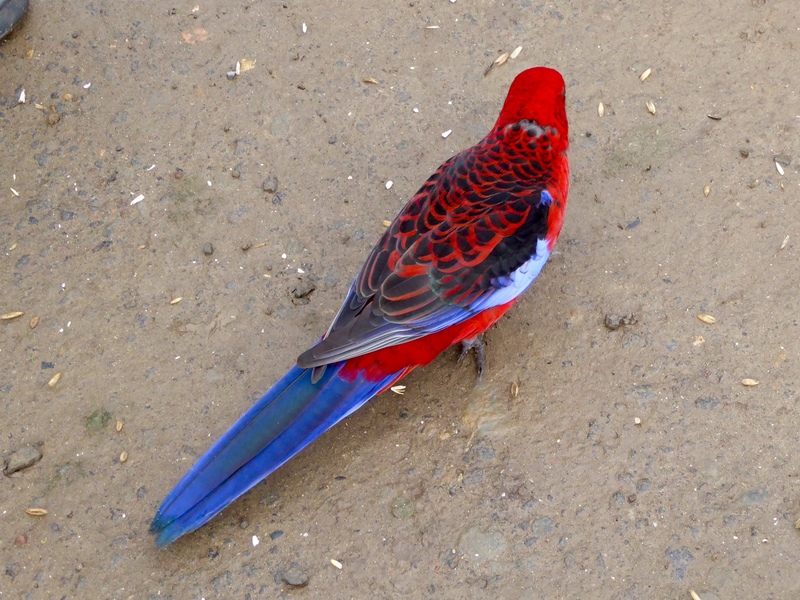 This Crimson Rosella was also happy to have a snack. 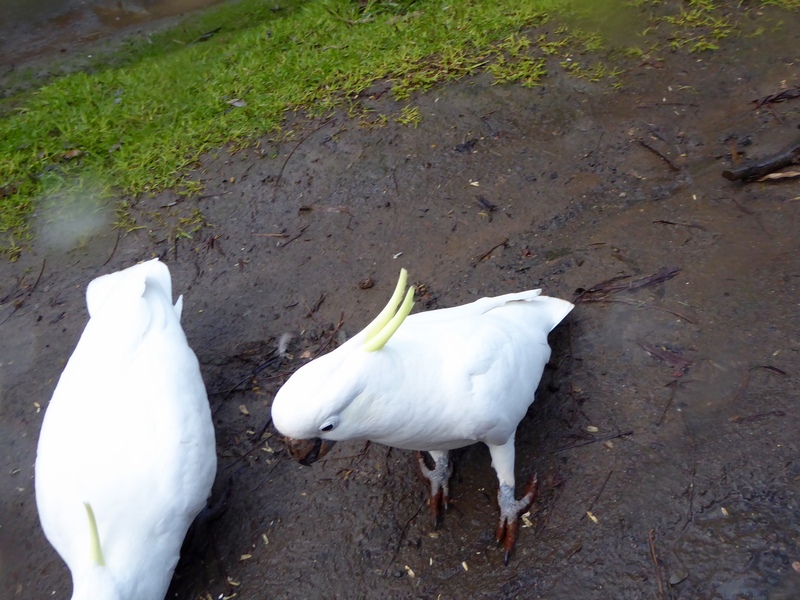 The Sulphur Crested Cockatoo were eager to get a share also. 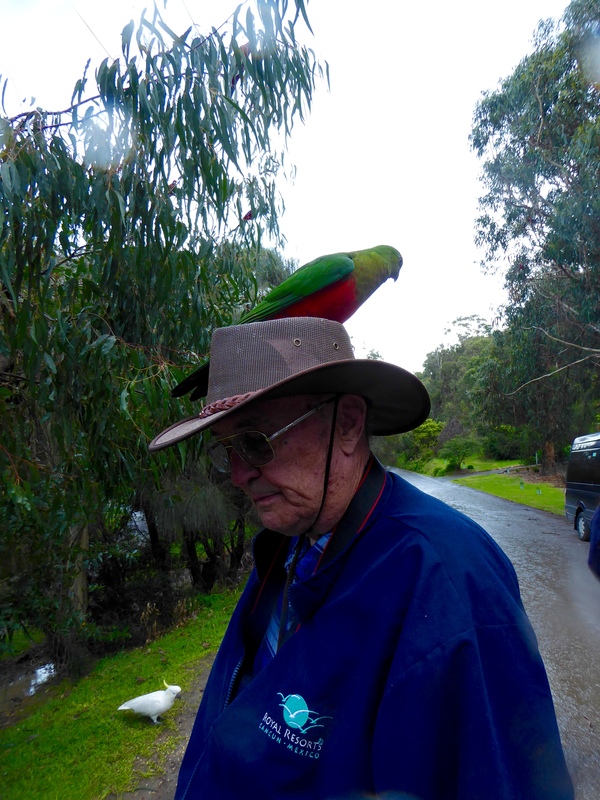 This King Parrot found a new place to sit. 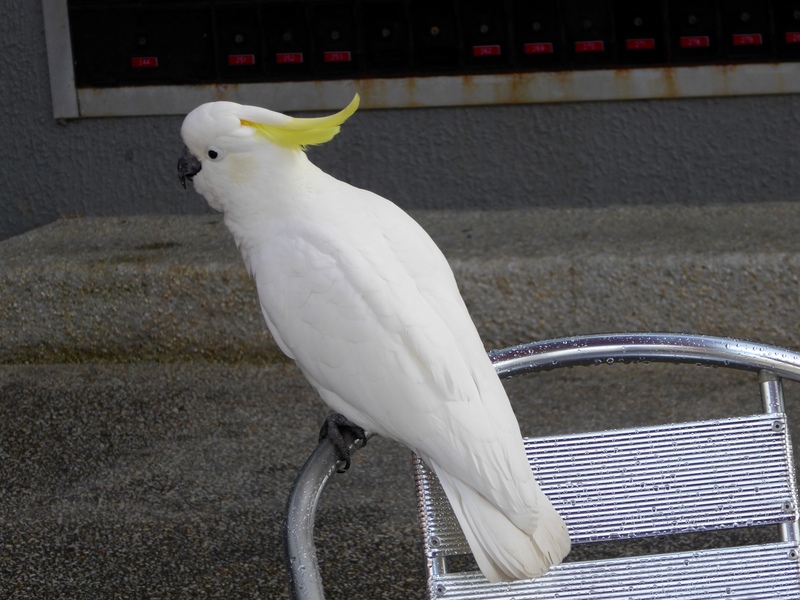 Along The Great Ocean Road, we saw many of these Sulphur Crested Cockatoos. We love them, but not everyone is a fan of these beautiful birds. Sulphur Crested Cockatoos are plentiful. Considered exotic birds in US and farmers pest here. They have very strong beaks and cause much damage in a farmer’s field. 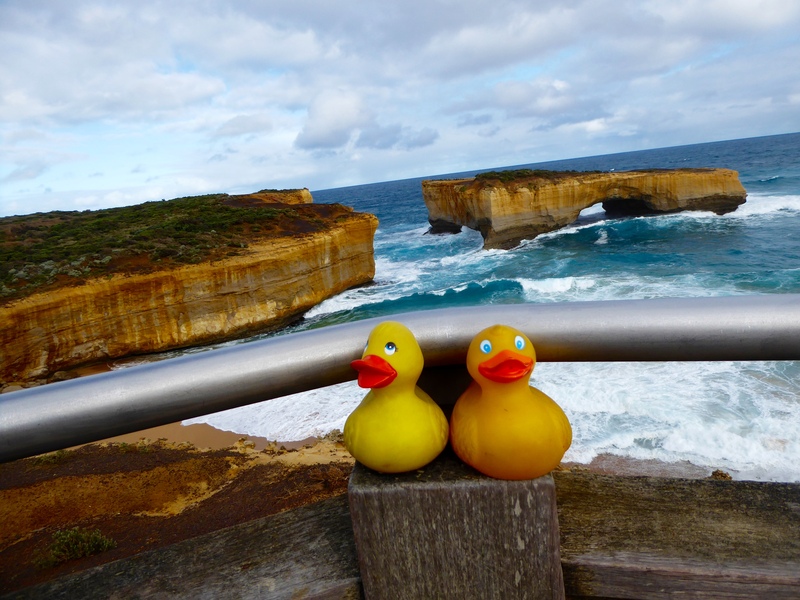 Along the Great Ocean Road, we stopped at Memorial Arch. 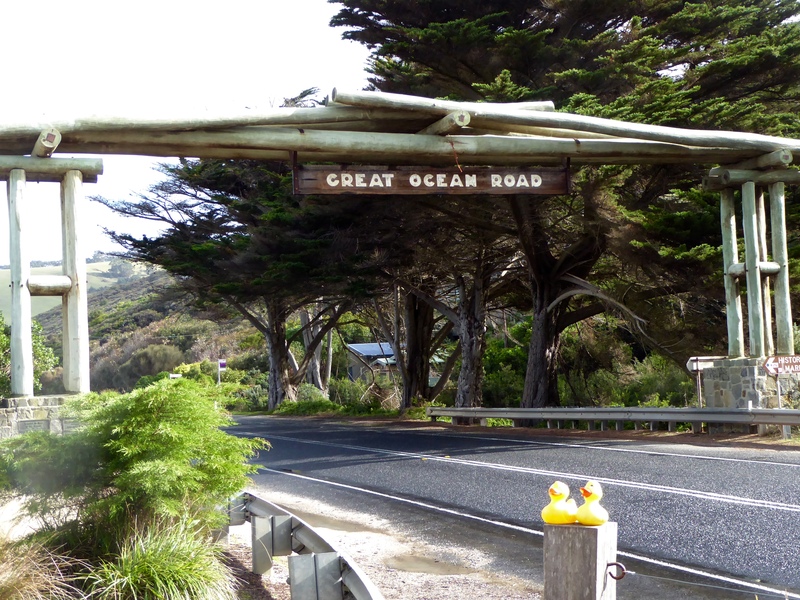 The Great Ocean Road was begun in 1918 with 3,000 workers, many returning veterans from World War I, and the project was completed in 1932. The road was built with axes and picks; no explosives were used. 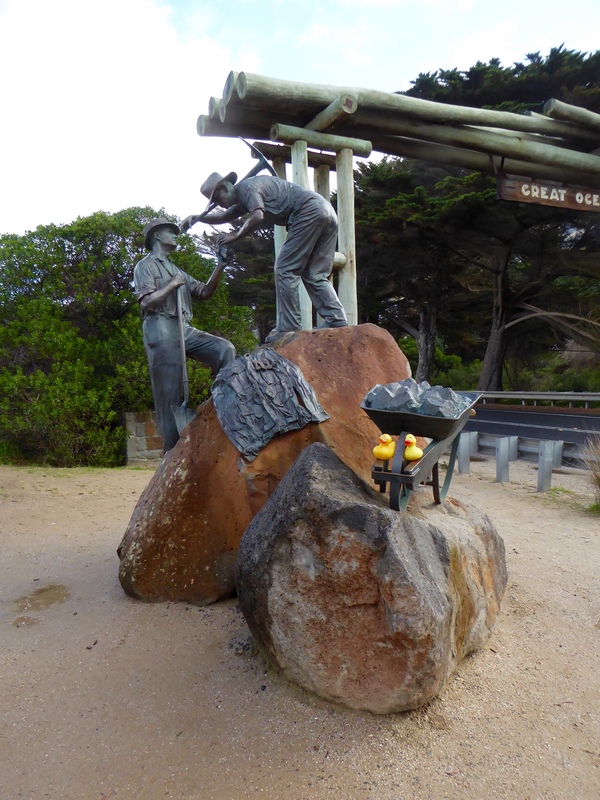 This statue commemorates the men that built The Great Ocean Road. 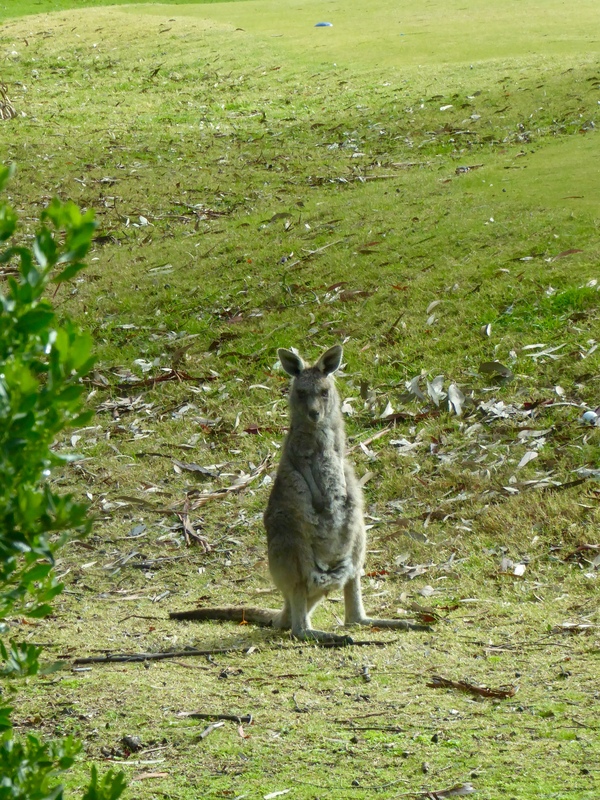 Our last stop of the day was the Anglesea Golf Course where we were greeted y this kangaroo. Is he saying welcome to our golf course? 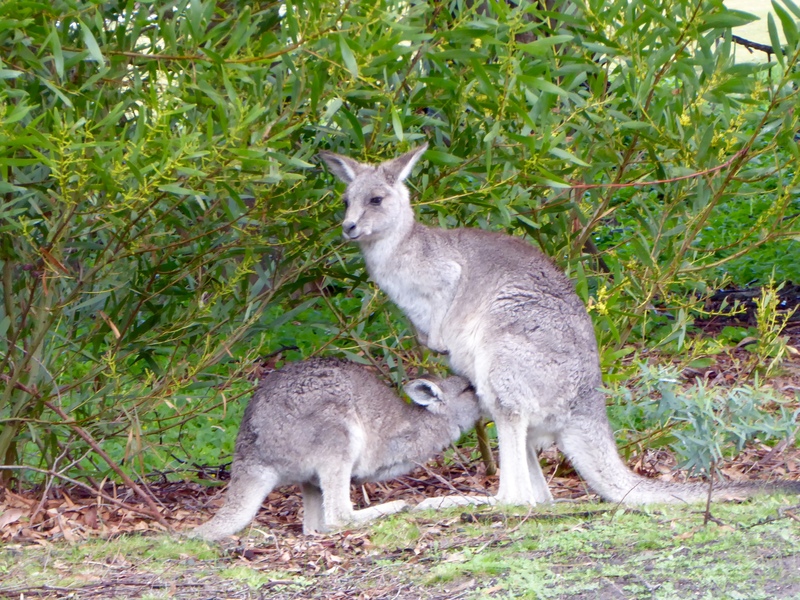 Several kangaroos were grazing on the edge of the fairways, but this young kangaroo wasn’t interested in grazing. Mom is still the best! Mom is still the favorite. 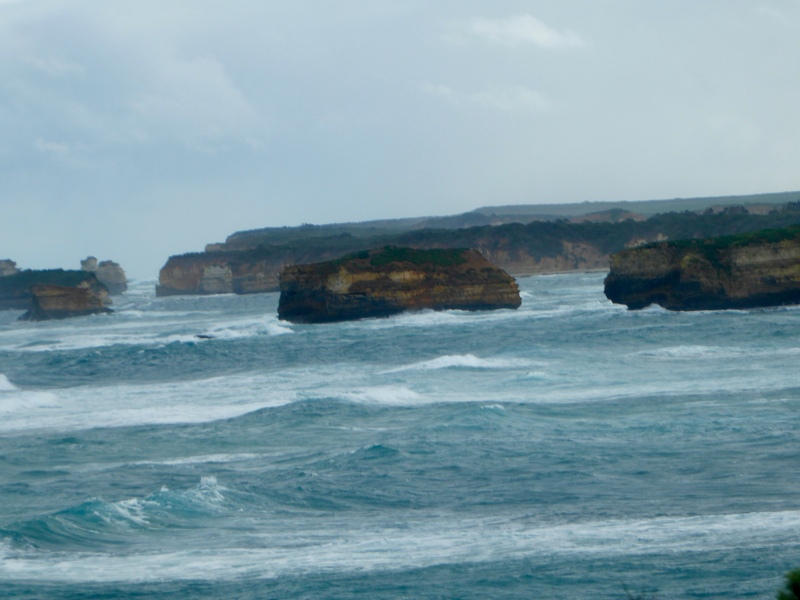 We really enjoyed our tour with Australian Natural Treasures Touring, and the Great Ocean Road is breathtaking. Visit them at http://www.anttouring.com.au Thanks Glenn and Jeremy. 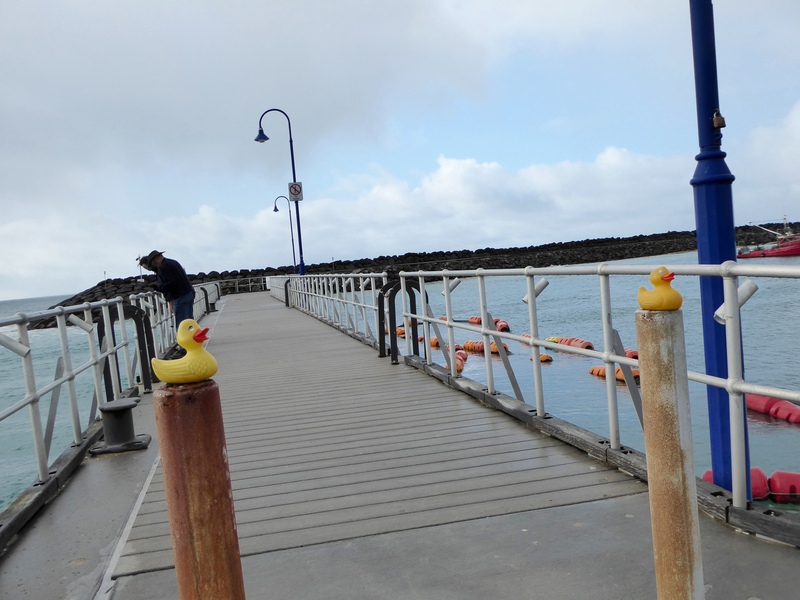 Zeb and Eider and the humans spent the night in Mount Gambier. This is Blue Lake, a dormant volcano. 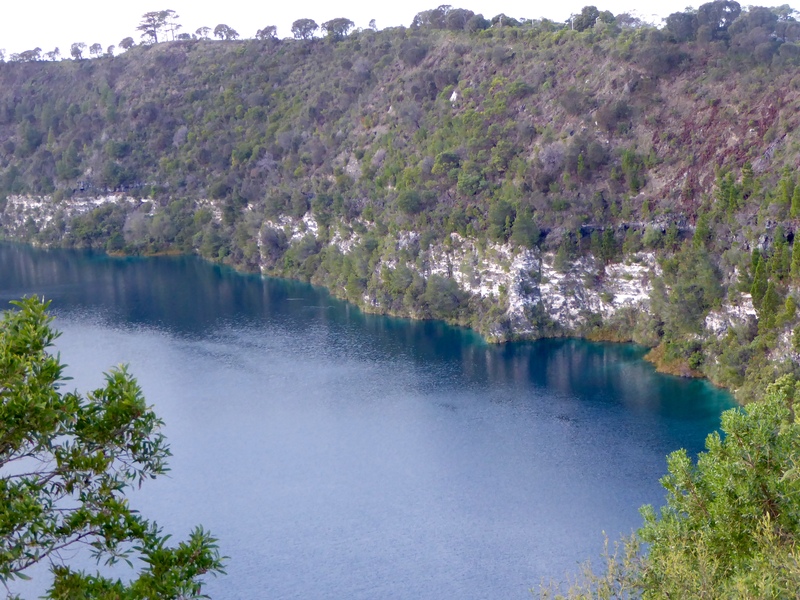 It is the water supply for Mount Gambier. And it is a very pretty lake. 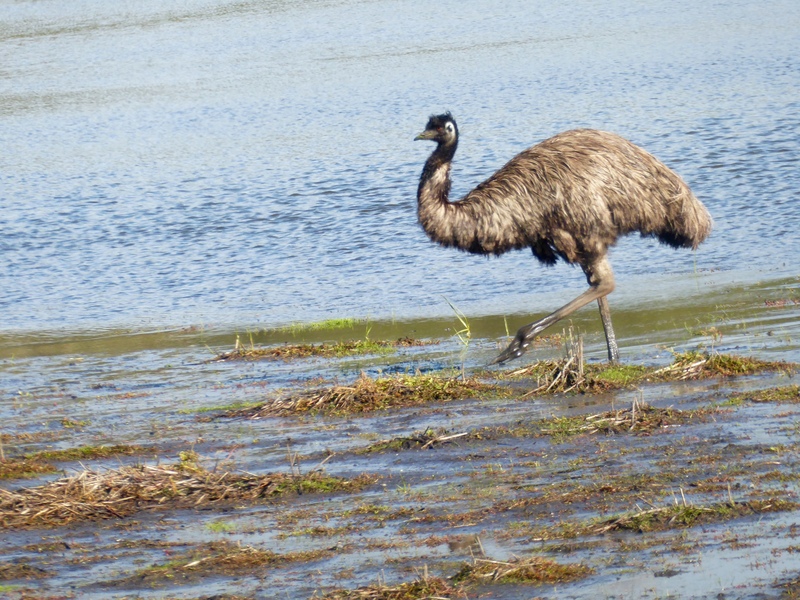 Shortly after crossing into Victoria, we admired this emu. 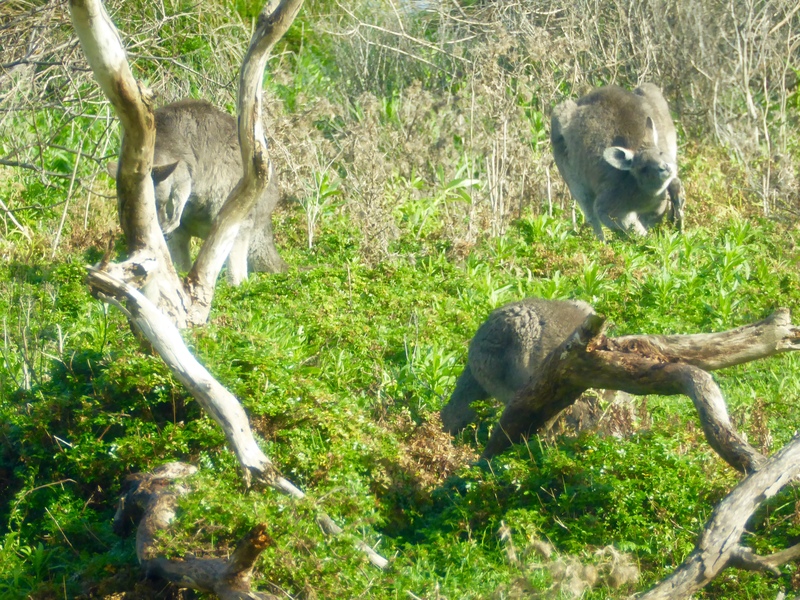 Of course, the kangaroos are always a favorite with humans. Logan’s Beach seems to be a whale nursery. We did see a Southern Right Whale in the distance, with her young. She was too far away for a good photo. 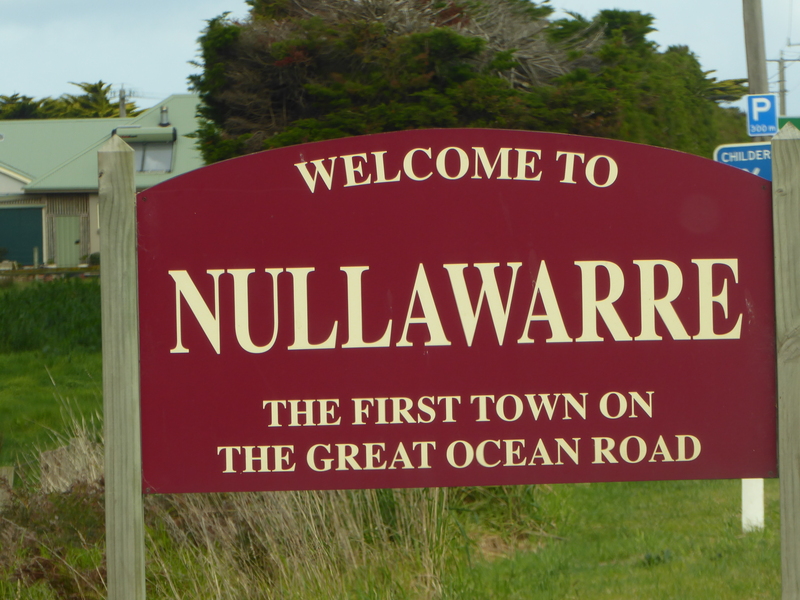 We are in Nullawarre and we are going on the Great Ocean Road. This is Bay of Martyrs. Here we are at Shipwreck Coast. 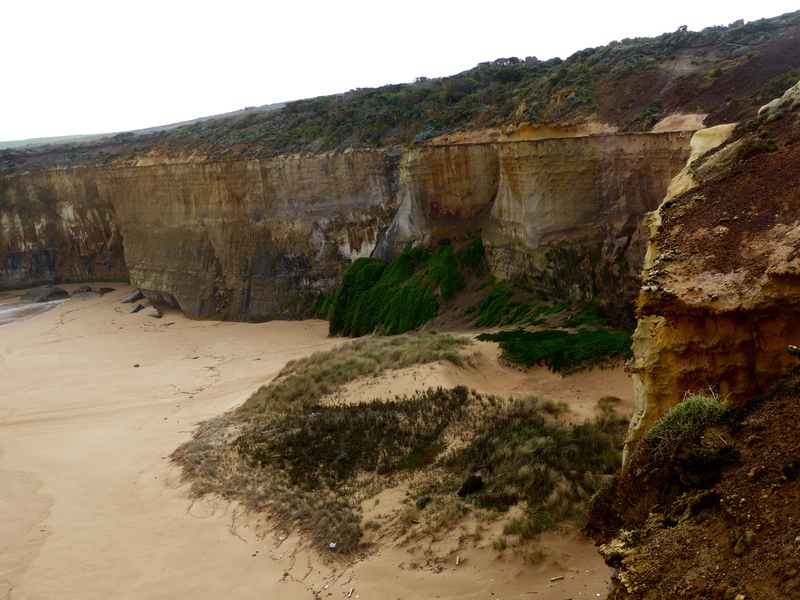 Shipwwreck Coast is about 130 km and has 638 known shipwrecks. 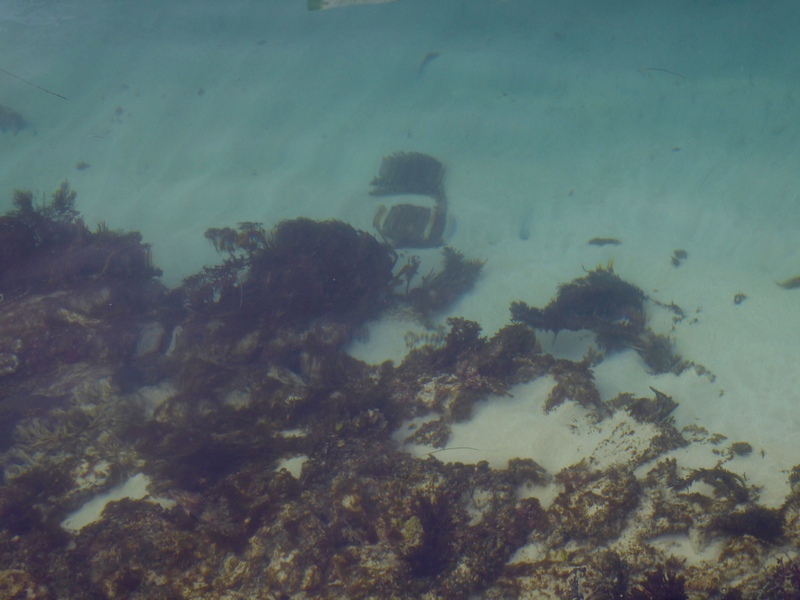 About 240 of these wrecks have been discovered. 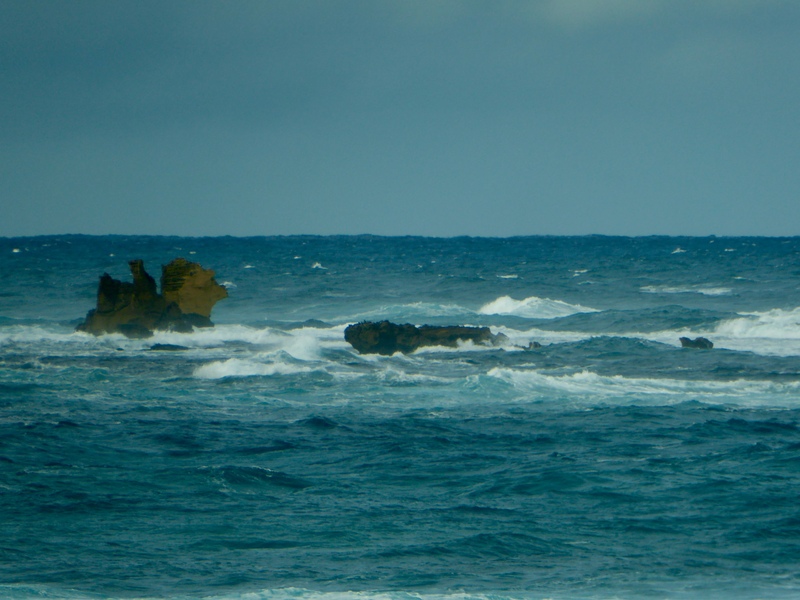 A very treacherous coastline. 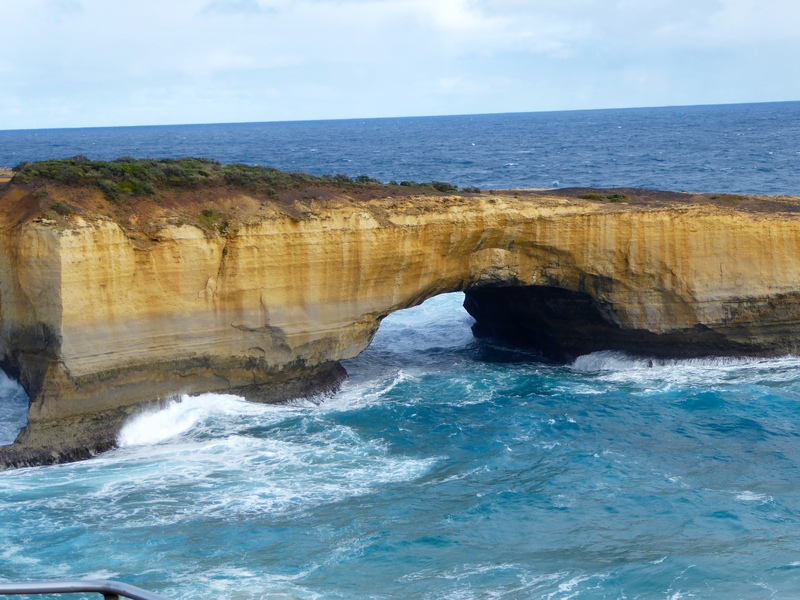 This is Australia’s London Bridge. There used to be a natural bridge connecting these two stone formations. In January 1990 it collapsed. No one was injured and no one was on the bridge when it collapsed. However, some people were stranded on the island created when the bridge collapsed. They had to be returned to the main side by helicopter. 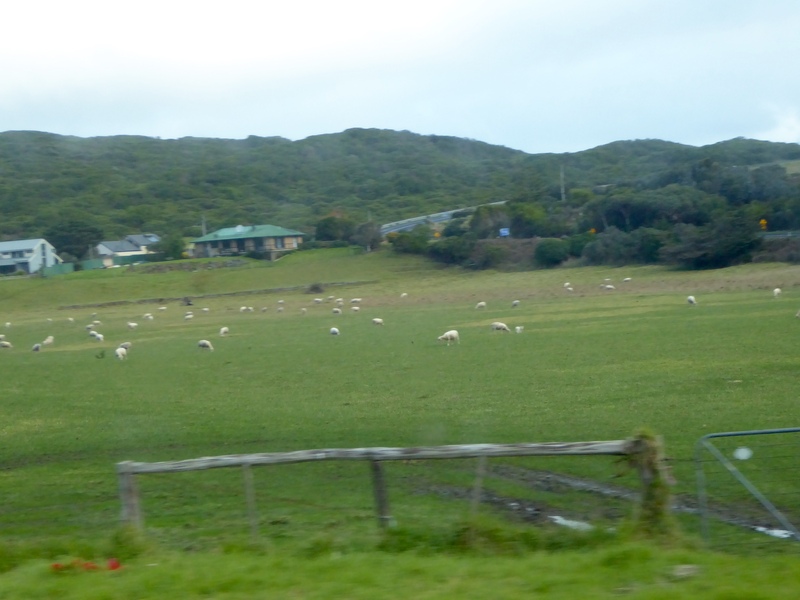 There is a colony of little (or fairy) penguins that live here. They fish and feed during the day. They come in at dusk. To protect them there are no stairs to the beach. The little penguins need to be protected. They grow to be about a foot or less in height. 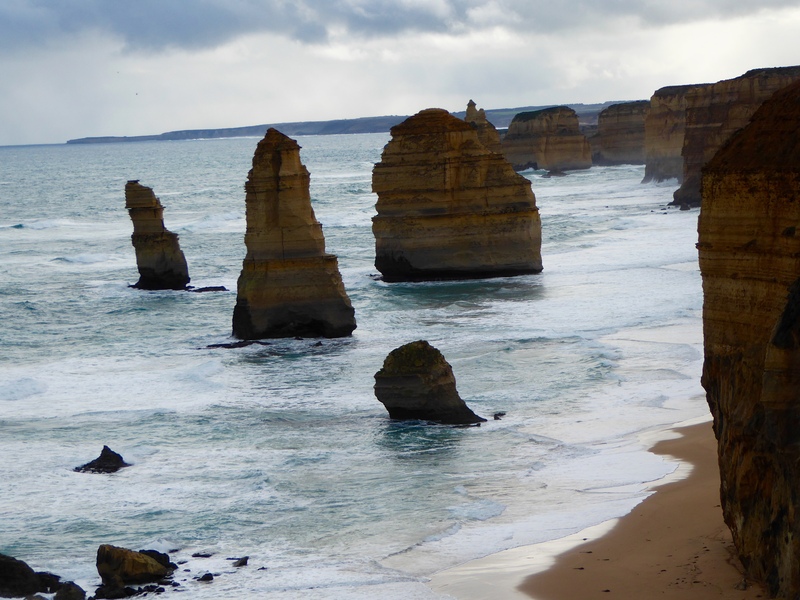 The humans saw them at another location in Australia about 10 years ago. They just love the little penguins. 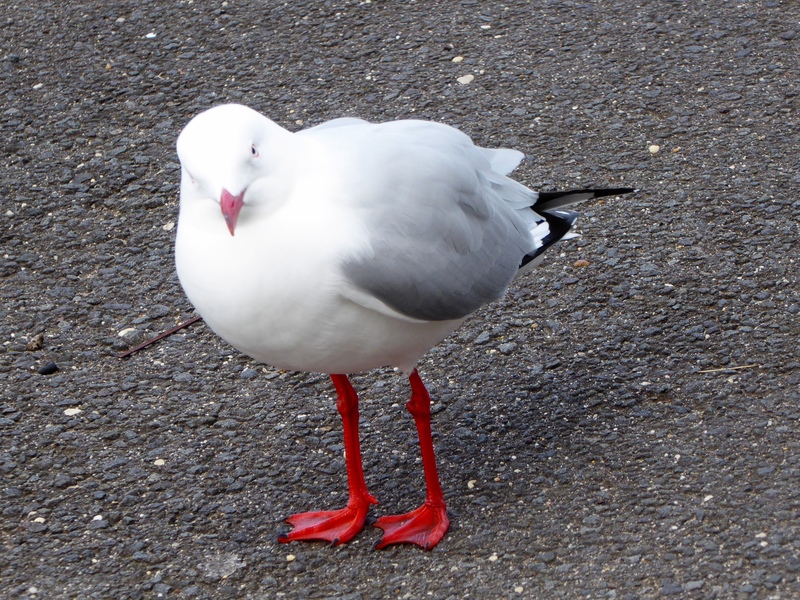 Stopping at Port Campbell, mom loved this seagull with her lipstick matching her shoes. 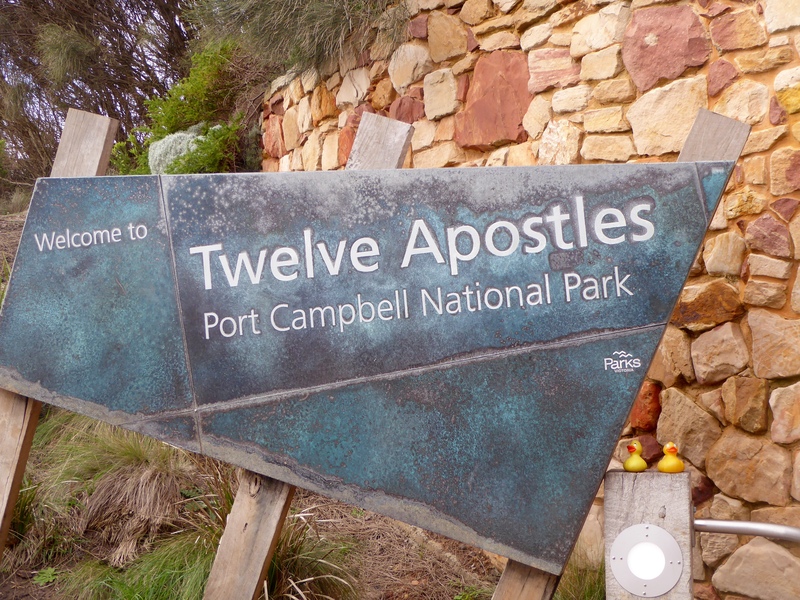 Next stop was the Twelve Apostles National Park. Beautiful! But 12?? Not any more, if ever. 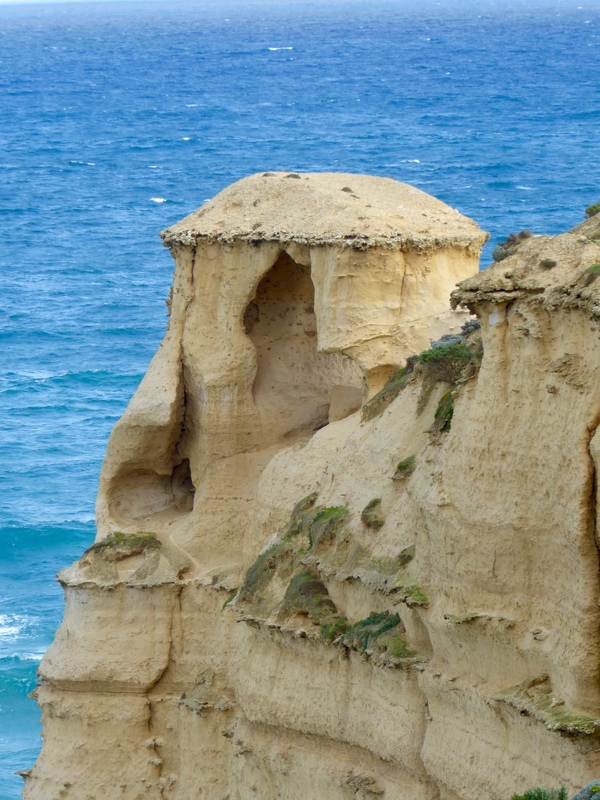 These limestone formations have been eroded and worn away by the strong ocean currents. Following the boardwalk to the left, these two additional sculptures, or apostles, are visible. Further down the path, we saw this structure attached to a main rock. This is a great road. 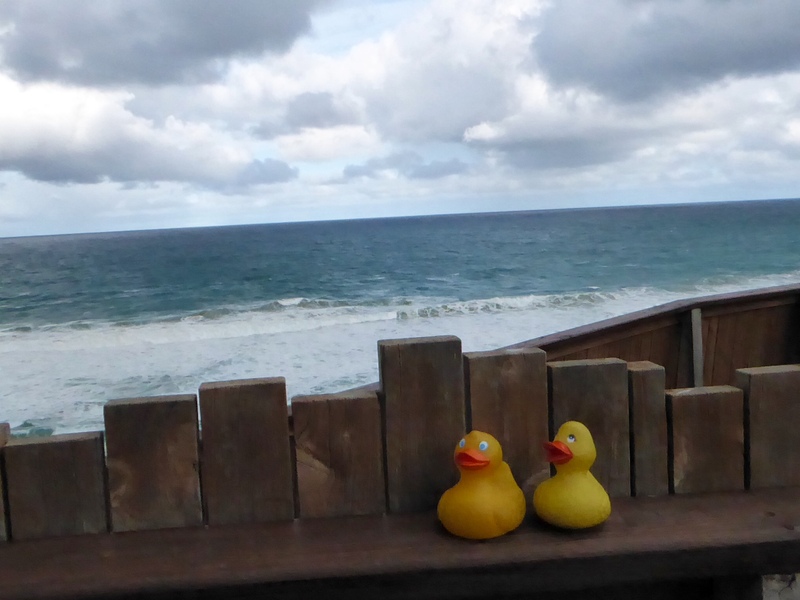 We loved the ocean on one side, while the farm and pasture land on the other side is also beautiful. This flock of sheep captured mom’s attention. We are still on our tour, so keep reading our blog to see what we experience next. 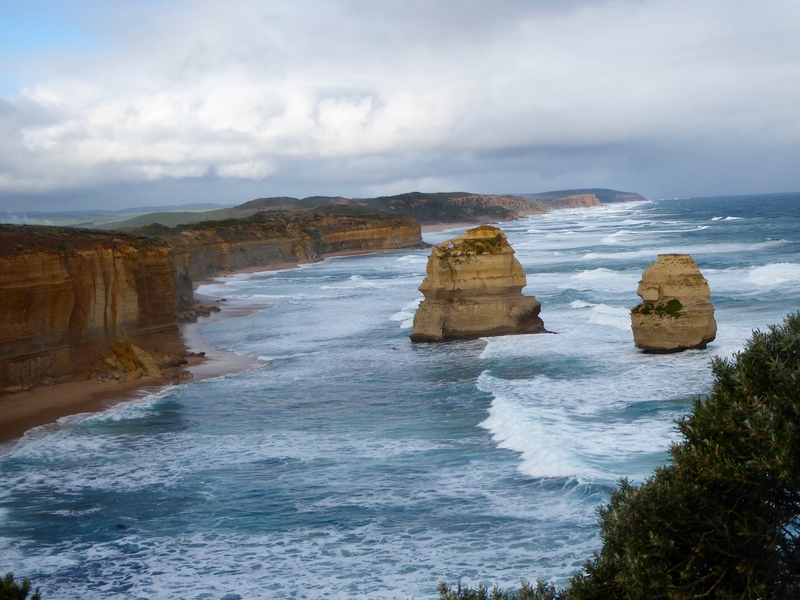 When in Victoria, Australia, don’t miss the Great Ocean Road.